If your plant fades to just green, not to worry, I have some very healthy Pings which stay green and grow vigorously. Color is a sign of the light level they have been experiencing. If you want the rich color of the P agnata Red Leaf in the picture above, increase the light intensity. Not direct sun, as they won’t tolerate that very much, but stronger indirect light or artificial lighting, such as fluorescent tubes. I haven’t had very good success with Grow Lights or sun spectrum systems. They seem to stay smaller. Cool white tubes work best for me, placed close to the plants, but be careful of overheating them. I place the tubes as close to the plants as I can keeping the temperature in the upper 70s deg. F.
Of course, not all Pings get this red. Many only color up to a light red, or pink. Others stay a bright green. See the picture at the top of this post. Just a quick update to the care sheet, originally published Oct 6 2007. 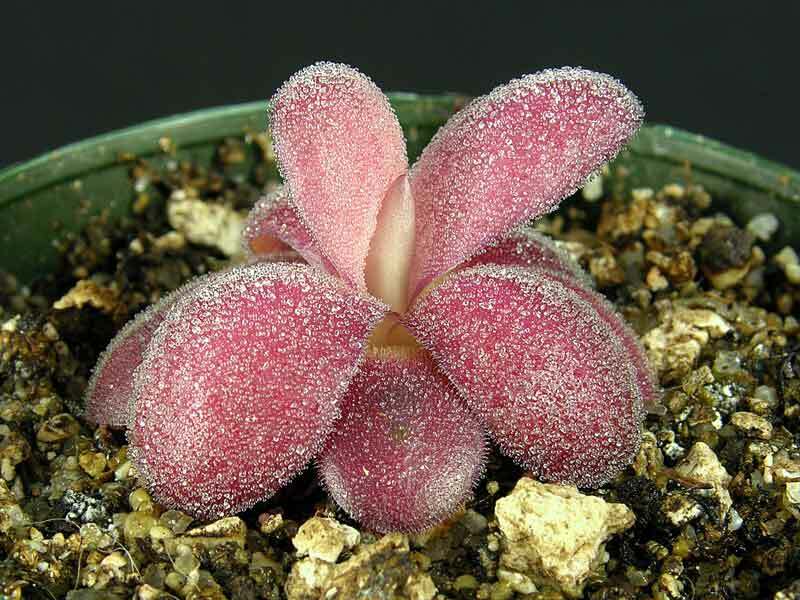 We now use our all-mineral Pinguicula potting mix exclusively. We still have the original peat-based mix available. Our all-mineral mix is made from equal parts of the Aquatic Planting Media (Arcillite and Zeolite) and silica sand, with a trace amount of iron and non-urea plant food added.